I have a lovely HOWARD MILLER (I think it is, because there is no name anywhere and the one on the dial has disappeared) mantel clock. This is a Westminster quarterly chiming clock. 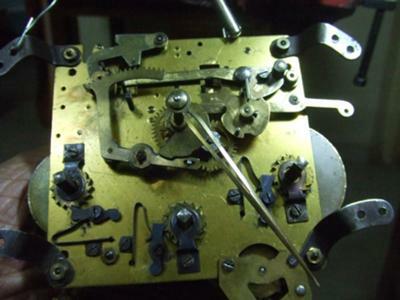 The time main spring slipped from its spindle and I had to dismantle the movement to repair it which I did. (I am a bit of a DIY man!). The end chime disc was a bit loose and I accidentally rotated it on its spindle. Now I can't get the thing to properly chime with the hand movement. Since all three systems namely the gong the chime and the time are so finely interconnected it has been a complete failure on my part to get it going again. I would be very greatful for your expert advice on the best way to synchronize them. 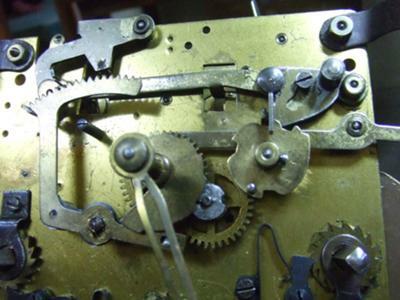 I think there are only two points to adjust the end chime disc and the chime fly stop lever. The latter I think is OK. I have sent two images of the movement for further clarification. Awaiting an early and a favourable reply.